A kernel panic is an action taken by an operating system upon detecting an internal fatal error from which it cannot safely recover. The term is largely specific to Unix and Unix-like systems; for Microsoft Windows operating systems the equivalent term is "Bug check" (or, colloquially, "Blue Screen of Death"). The kernel routines that handle panics (known as panic()) in AT&T-derived and BSD Unix source code) are generally designed to output an error message to the console, dump an image of kernel memory to disk for post-mortem debugging and then either wait for the system to be manually rebooted, or initiate an automatic reboot. The information provided is of highly technical nature and aims to assist a system administrator or software developer in diagnosing the problem. I remarked to Dennis that easily half the code I was writing in Multics was error recovery code. He said, "We left all that stuff out. If there's an error, we have this routine called panic, and when it is called, the machine crashes, and you holler down the hall, 'Hey, reboot it.'" The original panic() function was essentially unchanged from Fifth Edition UNIX to the VAX-based UNIX 32V and output only an error message with no other information, then dropped the system into an endless idle loop. As the Unix codebase was enhanced, the panic() function was also enhanced to dump various forms of debugging information to the console. A panic may occur as a result of a hardware failure or a bug in the operating system. In many cases, the operating system could continue operation after an error has occurred. However, the system is in an unstable state and rather than risking security breaches and data corruption, the operating system stops to prevent further damage and facilitate diagnosis of the error. After recompiling a Unix or Linux kernel binary image from source code, a kernel panic during booting the resulting kernel is a common and annoying problem if the kernel was not configured, compiled or installed correctly. Add-on hardware or malfunctioning RAM could also be a source of fatal kernel errors during start up, due to incompatibility with the OS or a missing device driver. A kernel may also die with panic message if it is unable to locate a root file system. During final stages of kernel userspace initialization, a panic is triggered if the spawning of init fails, since the system becomes unusable. Kernel panics appear in Linux like other Unix-like systems, but can also generate another kind of error condition, known as a kernel oops. In this case the kernel normally continues to run after killing the offending process. 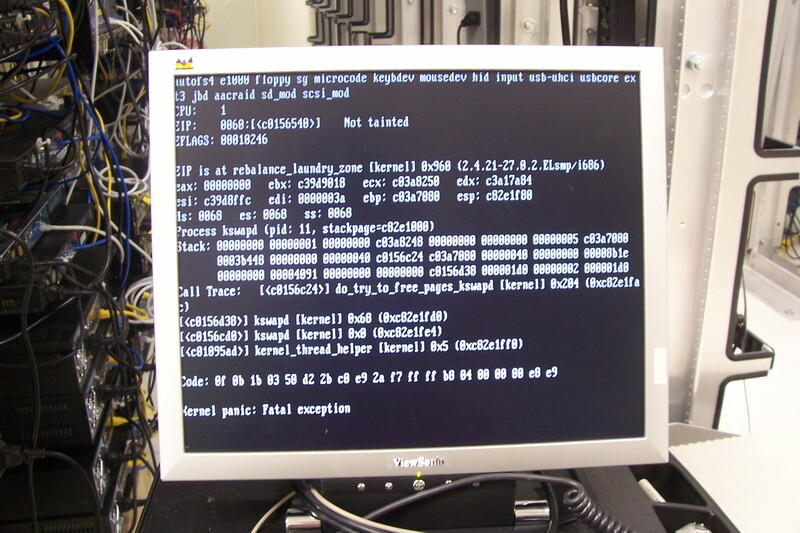 As an oops could cause some subsystems or resources to become unavailable, they can later lead to a full kernel panic. 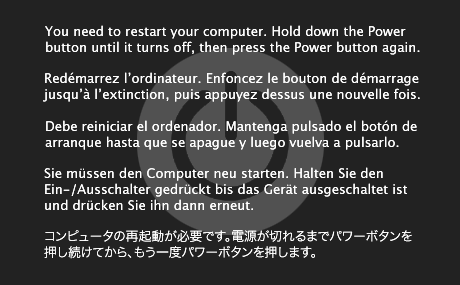 Mac OS X 10.6 kernel panic. 10.0, 10.1: The system prints text detailing the error on-screen and then the system becomes unresponsive. 10.2: Similar to the current versions of the kernel panic except the text is more spaced out and the background is white. 10.3 - 10.5: The background is now black, but with the same language translations and the same text as version 10.2. 10.6 - 10.7: The text is different and now includes a Spanish translation. In all versions above 10.2 the text is in superimposed on a standby symbol and is not full screen. Debugging information is saved in NVRAM and written to a log file on reboot.